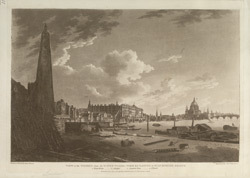 This view of the Thames shows from left to right: 1. waterworks, 2. Adelphi 3. Somerset Place, 4. St Pauls. The Waterworks company was founded in 1675, and it was erected at the river end of Villiers Street. York buildings was the name given to the streets and houses erected on York House, a former palace on the Strand. At its height, the company supplied 2,500 homes, although by 1803 the company's fortunes had dipped. This view shows the company's 70 ft high water tower, which was erected in the late 17th century. Also shown is the classical style terraced housing development called the Adelphi, built by the Adams brothers in the 1770s. Then along the river there is Somerset House, a former royal palace which was rebuilt in1775 by Sir William Chambers as government offices.